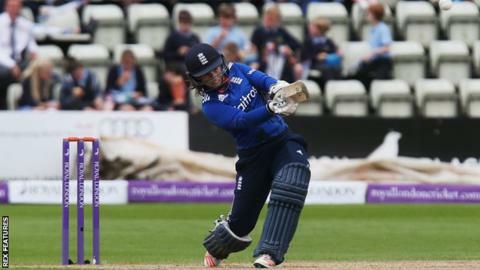 England opening batter Tammy Beaumont says she is honoured to replace Charlotte Edwards as Kent captain. Former England captain Edwards, 37, joined Hampshire in December after 16 years at Canterbury. Beaumont, 26, has spent her entire career at Kent, helping them win the County Championship and Twenty20 competition last season. "It's something that I always hoped one day I'd get to do and now that it's here it is a real honour," she said. "I've got pretty big boots to fill. Charlotte's going to be a big loss both in terms of her batting and her captaincy experience." Beaumont, who has won 81 caps for England in all formats of the game, was asked by BBC Radio Kent whether she thought her new role might help her to become England captain in future. She replied: "Heather Knight's doing a great job at the moment and I'm sure will be doing it for years to come. "But I think it would be nice to be thought of as potentially a leader in the future and I've certainly tried to act that way and bring ideas to the table when I do meet up with England. "The great thing about our squad at the moment is that everyone's voice is just as valid as anyone else, and hopefully I'm part of that."